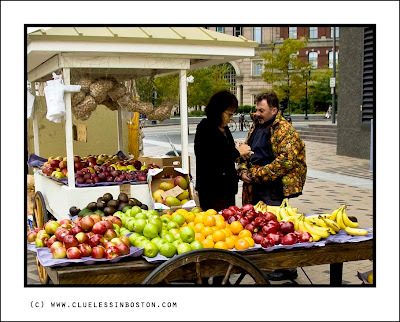 The fruit stand at South Station is a great place to buy fruit on the way to work in the morning. Good prices and good fruit. Nice photo and a nice composition including the people. How late in the year do they keep coming to sell the fruit? She really sets up an enticing display and you've captured it beautifully in this little slice of life image. It does look good! I would have to stop there every day. I'll have a banana please! A very good image. The jacket of the guy catches some colors of the fruit. Strange effect. Yum yum. Fruit is good. I wonder what the things in the bags are? Nuts? Here we have no little fruits stand like this. We have a big market, or nothing. And the way to present fruits is different. Funny to see those difference! For me, a red apple, please!